Many thanks to Lucy Howe for her article in the catalogue for Possible Futures: What is to be done? 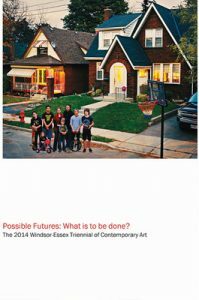 The 2014 Windsor-Essex Triennial of Contemporary Art. With essays by Srimoyee Mitra, Melissa Bennett, Lucy Howe, Stuart Reid; and Gregory Tom. Many thanks to Triennial curator Srimoyee Mitra and curatorial committee members Melissa Bennett, Curator of Contemporary Art, Art Gallery of Hamilton; Lucy Howe, artist, Windsor; Stuart Reid, Director/Curator, Rodman Hall Art Centre, Brock University, St. Catharines; Gregory Tom, Gallery Programs Director, Eastern Michigan University Art Department, Ypsilanti.